Thanks to subscription boxes that are filled with sample products claiming to be “the best” skin care product available, it’s no wonder people struggle to get their desired results. Many people don’t realize that the real problem lays with over-treating your skin with all the wrong products. The Boulder dermatologists at Kallgren Dermatology have the knowledge required to professionally treat all of your skin conditions and direct you to the best skin care regimen. Avoid getting caught up with products that aren’t really treating your skin condition, and contact our dermatology clinic today to set up a consultation with a Boulder dermatologist. If you can’t get enough of skin care and beauty products because you want what’s best for your skin, that’s okay. We won’t argue with someone who wants to achieve clear, smooth, flawless skin. In fact, we’re here to encourage that and provide you with helpful skincare tips to incorporate during your routine. Keep reading to learn new skincare tips from Kallgren Dermatology. This tip may serve as a reminder rather than a piece of advice because everyone knows to apply sunscreen every morning. But we can’t stress it enough—apply sunscreen every day! It doesn’t matter if you are spending the day at the beach or working indoors all day, a quick application of sunscreen every morning will go a long way. Hundreds — if not thousands — of studies have shown that a broad-spectrum sunscreen that is at least SPF 30 is best. Sunscreen will prevent skin cancer, the effects of aging, and other harmful elements that cause skin damage. Fortunately, many skin care products like moisturizers and makeup include SPF 30 so you won’t worry about forgetting to put some on each morning. Have you ever had those evenings when you’re so tired, you fall asleep before washing your face? It’s okay to admit it because we’ve all been there! As long as it is not a continuous habit, you shouldn’t have anything to worry about. However, completely removing your makeup every night is the key to clearer and healthier skin. It may be an added step to your routine, but it is necessary in order for your facial cleanser to be effective. Your skin becomes a clean canvas that is ready to absorb product, and your makeup can act as a barrier that prevents an effective cleanse. A helpful tip, once you get home and change out of your work clothes is the best time to remove your makeup and wash your face, just in case you doze off before you make it into bed for the night. Face moisturizers help our skin in more ways than treating dry skin. A quality moisturizer supports our skin’s barrier by providing well-needed lipids and protects from external chemicals. Not sure what moisturizer to by? Kallgren Dermatology can help you find the perfect moisturizer from our selection of skin care products. Stop in our dermatology clinic or call us to schedule a consultation! Eating well does the body well, you probably already knew that. But if your skin won’t manage to get any clearer, even after you’ve tried treatments and products, you might want to look at the quality of your diet. 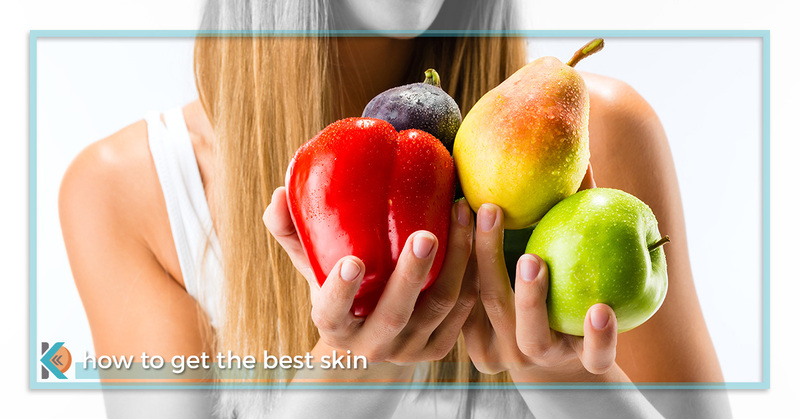 While we encourage a healthy diet regardless of skin types, but a poor diet could contribute to breakouts and other challenging skin conditions. In addition to eating well, you might want to find out if you have any food allergies like dairy or gluten. Most reactions affect the digestive system, but it can also affect your skin. For example, people who are lactose intolerant or have too much dairy for your body to digest, it may come out in the form of painful cystic acne along the jawline. Consuming dairy may influence endogenous hormones.